I don't usually eat store bought snack foods mainly because of all the nasty ingredients that are in them and prefer to just make my own. 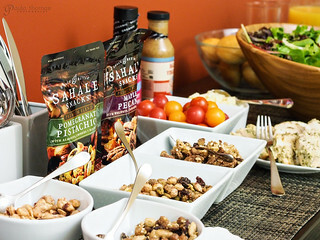 Then Sahale Snacks came along which I was introduced to at the International Food Blogger Conference in Seattle a couple of months ago though they've been around for many years. I was happy to see that the ingredient labels didn't have a laundry list of ingredients like most processed snacks in a bag. They use whole ingredients: nuts, unsulphured fruits, spices, organic sweeteners (honey, cane syrup and/or tapioca syrup) and no preservatives and they are gluten free! Seemed like my kind of snack so I tried the maple pecans and was blown away by the flavors and texture. I was excited to get an invite for a tour of their snack factory. It was during a week day so I took the day off from work and made a 45 mile drive to Tukwila, WA for the tour. Their mission statement is displayed on the wall as you walk in the front entrance. 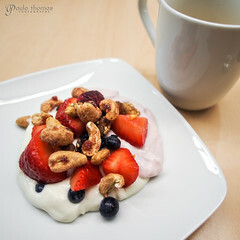 We were greeted with a nice breakfast of yogurt and berries topped with a choice of two of their nut blends. 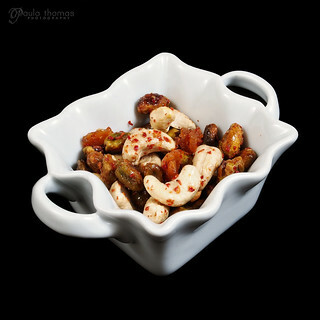 I chose the cashews with pomegranate and vanilla and a cup of coffee. 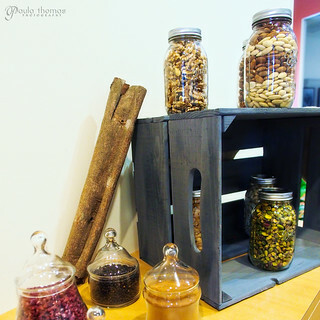 While enjoying breakfast, the owners, Edmond Sanctis and Josh Schroeter, joined us and told us about the history of Sahale Snacks and about the pride they have in the ingredients that go into them. Edmond and Josh have been best buds for 25 years. People say you shouldn't go into business with your best friend but they've proven that it can be done. After 10 years of being in business together their friendship has only grown stronger and it shows if you ever meet them. Edmond and Josh met as news reporters right out of college and went to graduate school together at Columbia University. They didn't always live near each other but they stayed in touch and every year they got together to go hiking in the Cascades. Edmond and Josh aren't your typical hikers. They are both food enthusiasts and they want their hikes to include a good food experience. Every year they stop at Pike Place Market and stock up on gourmet meats, cheeses, capers, spices and yes even wine and whatever else they could find that looked good and brought it all with them on their hikes. It sounded like a blast and it made me want to go hiking with them. They started looking into what was available for snacks while preparing for a Rainier climb. They didn't have room in their packs to bring their usual spread of gourmet food and had to resort to boring trail mixes and energy bars. When they got back from their climb, they decided to do some experimenting in the kitchen and make their own enjoyable gourmet snacks that they can take on hikes and the rest is history. They named the brand after Sahale Peak, one of their favorite hikes in the Cascade mountains. I embarrassingly only recently learned the proper way to pronounce it: suh haw lee. Edmond and Josh are best friends and business partners and it was a challenge to get them to pose and be serious for a picture. 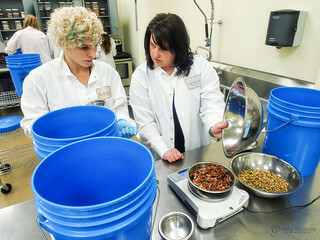 They put a lot of thought into each and every ingredient that goes into their snacks and choose the best they can find. For example they get their cinnamon and black pepper from Vietnam and their Vanilla from Madagascar because they did their research and found that is where the best is. They love to travel and have been to Vietnam and saw how the cinnamon is harvested. They are involved with Peace Trees Vietnam, a Seattle based organization that is working on the safe removal of bombs and land mines that are covering 85% of the land in Central Vietnam. Once the land is made safe, buildings can be constructed and much of it will become farmland which Peace Trees also helps with planting. Edmond and Josh are hoping to also visit Madagascar and see how the vanilla is grown, harvested and processed in person. Edmond and Josh did a lot of experimenting with flavors, they still do and we got to do some experimenting of our own. We put on some lab coats and started thinking about what we wanted to make. 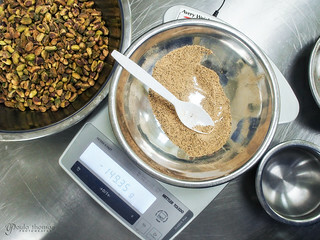 We got to choose between pistachio, almond, cashew and pecan for our main ingredient. We also had a selection of fruits to choose from but I'm the only one that decided to do a no fruit blend. They also had a cabinet full of spices for us to use. We had a little assistance with the nut to fruit to spice ratio and the rest was up to us. I made a pistachio Mexican blend with guajillo chile powder, cumin, ginger, salt, pepper, lemon, orange and a little buttermilk. I liked how it came out though I think lime would have worked better than the lemon and orange but that wasn't available. Some cayanne would have probably been good too for some more heat. They did the glazing and toasting for us and shipped everyone a sampling of all 5 creations. I had some fun and did a little taste test with Mark and made him choose his favorite. He had no idea which one was mine and I assured him I wouldn't feel bad if he didn't pick mine. He had a hard time choosing between Jacqueline's Mango Salsa and A&J's Ricotta Blueberry Pancake but ultimately went with the mango salsa and we both agreed it was the best looking one of the bunch but my favorite was hands down the blueberry pancake. After the experimentation we went back to the conference room we had breakfast in and had lunch. 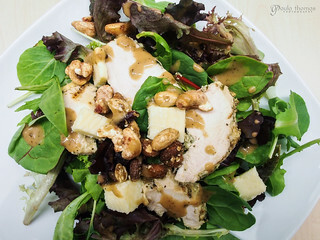 We had a nice green salad with sliced chicken breast and a few choices of Sahale snacks to garnish. This time I chose the pomegranate pistachio and drizzled some creamy balsamic dressing over the top. 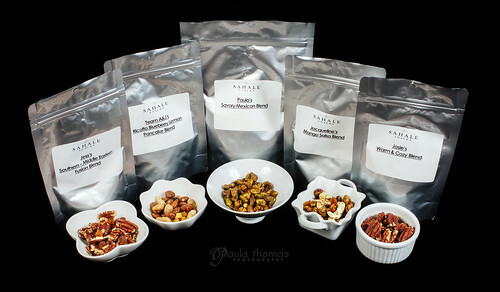 I learned that Sahale Snacks are great addition to any meal. After lunch we put on hair nets and went for a walk around the production floor. We got to see the almond roaster which is a really old machine but still works surprisingly well. It's in its own room and the aroma of roasted almonds filled the room. We also walked through the humongous pantry where they store all of their ingredients and inventory. One of the challenges for companies is deciding how large of a building to purchase. This isn't their first factory as they have had such success and had to expand. It looks like this building has plenty of room for growth so they should be able to stay in this location for a good while. 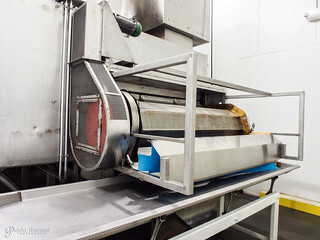 The last stop was the packaging room where a machine does a pretty quick job of packaging the snacks. They were packaging Almonds with Cranberries, Honey + Sea Salt, one of my favorite blends. Sahale Snacks takes the quality of their product very seriously. Every batch that comes out of the factory is taste tested for appearance, aroma, texture and taste and if they don't score high enough they they don't get sold to customers but are donated. 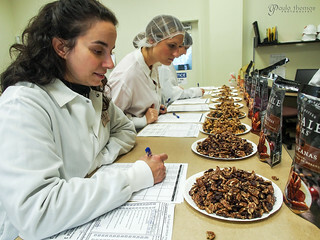 We got to play inspector and judge the maple pecans and almonds with cranberries that were produced the day before. It was interesting to see how the different batches had slight differences in the 4 categories. I will warn you that if you try them, you will likely get addicted to them like I have and start putting them on everything. Use their store locator to see where you can purchase these incredibly tasty gourmet snacks near you or you can get them on Amazon. Below are links to a few of my favorites. 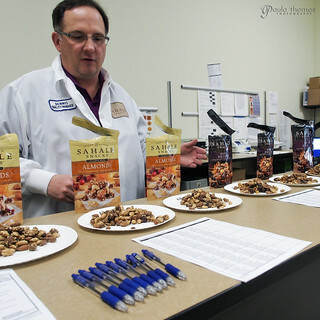 You can find more pictures from my tour at the Sahale Snack factory on my website. Jacqueline, the hedonista, also posted about the tour on Heed the Hedonist along with the recipe for Sing Buri Cashew Brittle from our dinner at Urbane.